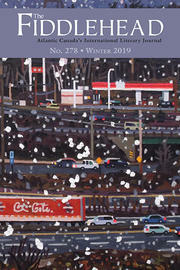 Interview by Emily Skov-Nielsen, Marketing and Promotions for The Fiddlehead. 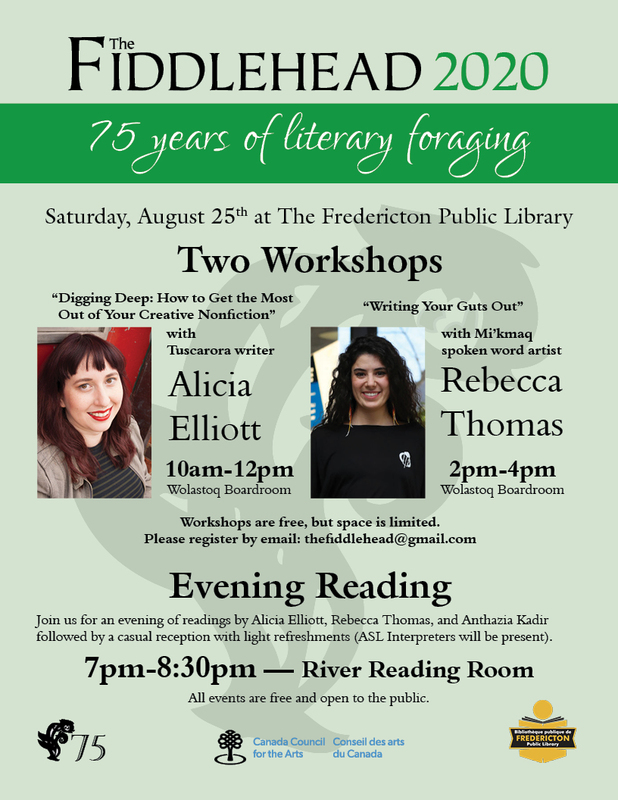 Rebecca Thomas will be in Fredericton on August 25 to give a workshop "Writing Your Guts Out" from 2-4 at the Fredericton public Library and to give a reading later that evening at 7pm, also at the Fredericton Public Library. For more information, visit the Facebook event here or scroll down to see the poster. You can also revisit our interview with Alicia Elliott here. Emily Skov-Nielsen: I’d like to start by asking a question in regards to the upcoming workshop that you’ll be offering as part of The Fiddlehead’s 2020/75th anniversary events, entitled “Writing Your Guts Out.” I’m wondering what you hope to accomplish with this workshop, and for anyone who might be interested in participating, what should they expect? Rebecca Thomas: I hope to get people writing. So many people I meet say they don’t know how to get started or how to take their feelings and put words to them. This workshop is adapted from one I took with Mary Pinkoski, along with other exercises I’ve used throughout the years to break writer’s block, get words flowing and be ok with “bad writing.” After all, writing is a process; not every stage is going to be pretty and polished. Rebecca Thomas: In all honesty, performance came long before the writing. I did drama as a kid in school and theatre in university. I’m Child number 6 of 8 and performance was a way I could stand out to my family and community. I didn’t start writing until well into my twenties. Emily Skov-Nielsen: In an article on the Dalhousie University website, when speaking about your Indigeneity in relation to your writing, you’re quoted as saying: “It’s nice to be able to write about a very negative history in a way that’s beautiful and that teaches.” I’m wondering if you could comment on what you see as the function of beauty in your work, especially when, as you say, you’re writing about very negative, traumatic material? Rebecca Thomas: Indigenous people have been to hell and back. We are still fighting for recognition, empathy, understanding, and equity. We’ve experienced complex trauma that spans generations. However, in spite of all that, we are here, we are strong, and we are resilient. The best laughter I’ve ever heard and have been a part of is when I’m with community members. The words that I weave together teaches the history of that tragedy and links it to our persistence as a people. We can experience the most horrendous of histories and come out on the other side as whole, albeit scarred, people. There is such beauty in that imagery. Emily Skov-Nielsen: Lastly, because of the work you did with Indigenous youth during your time as Poet Laureate of Halifax, I’m wondering what message you’d like to send out to the young writers/activists of today ― what advice would you give in terms of how to be effective “change-makers,” which is a phrase you used to describe your own role as an artist? Rebecca Thomas: Keep writing. All the time. Write notes in your phone, scribble on paper, carry a notebook with you. Also, understand and try to see that there are so many facets to an argument. If one approach isn’t working, try another and another and another. Be gentle and stay kind. Grow a thick skin and keep a soft heart. Rebecca Thomas is a Mi'kmaw poet and activist who does not want to be a poet or activist. She just happens to be good enough at poetry and persuasion to get people to listen but her ultimate goal is to make Canada a better place for her Indigenous community because so many people tend to forget they were here first. She has captained the Halifax Slam Poetry team three years in a row, taking HaliSlam to the semi finals in 2016. She has accidentally found herself as the former Poet Laureate of Halifax. She has performed with a Tribe Called Red and has spoken and lectured at conferences and coffee houses from coast to coast. She writes kids books about growing up the child of a residential school survivor. She has written for the CBC and Washington Post but has yet to make a chapbook. She pays her bills by working as the Senior Diversity Consultant for the Public Works Commission. She'll be doing some cool symphony stuff with Kitchener Waterloo Symphony and Symphony Nova Scotia but does not play a musical instrument, so we'll see how it goes! She also feels real uncomfortable writing bios about herself. She's done some other things here and there but has reached her tolerance for hearing her accomplishments listed off.